True Story: I was visiting a park a few years ago and happened to meet three little boys around 7 or 8 years old. They wanted to show me their little friend and took me to the park building where he lived. Underneath a window that was in the restroom there was a small 3 inch hole in the cement at the base of the building. The boys called to their toad-friend (I forget his name) and to my amazement, the little guy appeared in his little door and hopped out and I was introduced to him! I am sure there was a slow leak in a pipe somewhere under the building near that little hole that made the little toad’s home very nice and moist. 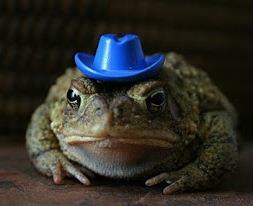 All that little toad needed was a special hat!